This talk was given at the opening of the current ango training period. 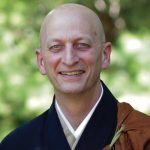 Shugen Roshi addresses the theme of the ango, and questions how we can best honor our lineages, knowing that the manners of the past can sometimes clash with our own values of equality and inclusivity. Check out the audio above or watch a video of this talk below. With apologies, the video image cuts out during the last couple minutes of the talk. The audio, however, remains consistent through the conclusion.